*The share price is the closing price on June 27. The number of shares issued, ROE and BPS were the values for the previous term. *The company conducted 1-for-10 reverse share split on Oct. 1, 2017. DPS and EPS represent the amounts before taking into account the 1-for-10 reverse split. *The company conducted 1-for-10 reverse share split on Oct. 1, 2017. DPS and EPS for the term ending Mar. 2018 represent the amounts before taking into account the 1-for-10 reverse split. This report outlines the financial results of KYB for the term ended Mar. 2017 and its mid-term management plan, and includes the interview with Mr. Nakajima, Representative Director, President, and Executive Officer. The largest manufacturer of independent hydraulic equipment in Japan. 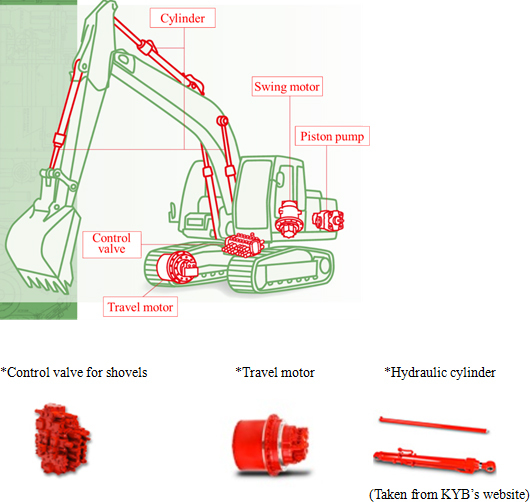 Based on hydraulic technology, the company offers products and technologies in a wide range of fields such as "four-wheeled vehicles", "two-wheeled vehicles", "construction machinery", "industrial vehicles", "aircraft", "railroads" and "specially equipped vehicles". KYB has a high market share with many products. 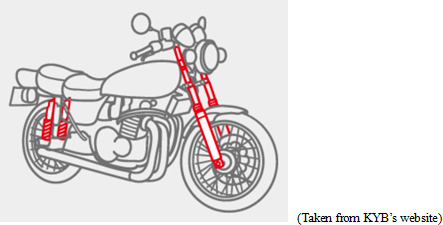 For instance, shock absorbers for four-wheeled vehicles account for 43% of the domestic market and 15% of the global market. The Japanese market has grown slightly due to the Tokyo Olympics and Paralympics demand and the fourth exhaust gas regulation, which will expire in August 2017. The Chinese market, which is said to occupy about one-third of the global market, is gradually recovering after the peak of oversupply, which was caused by economic stimulus measures following the Lehman Brothers' fall. The Indian market continues to grow with strong infrastructure investment. As for excavators of 6 tons or heavier, KYB expects the market to continue steady growth for the time being. Its global competitors consist of Sachs in Germany, Tenneco in the U.S., and so on. Sachs has a long history and intimate relationships with European automobile manufacturers. This segment consists of hydraulic shock absorbers for automobiles and motorcycles, hydraulic equipment for automobiles, and other products. KYB's steering components include the "hydraulic steering (PS)" that uses the hydraulic power assist unit to support turning of the steering wheel done by drivers and steer the tires, and the "electric steering (EPS)" that uses the electric power assist unit composed of a motor, a controller, a torque sensor, etc. to support turning of the steering wheel and steer the tires. KYB's concrete mixer trucks have high mixing and emission performance, accounting for about 83% of the domestic market share. In 23 countries worldwide including Japan, KYB has a total of 64 bases, including 49 group companies, regional headquarters (6), production bases (37), and sales office/other service (21), establishing strong global networks. Lately, the company has focused on product development related to automatic driving systems. KYB considers that the technology, which enables more comfortable and smoother driving in any road surface conditions independently of the drivers' skills and judgment, is definitely indispensable for automobiles with the automatic driving system. 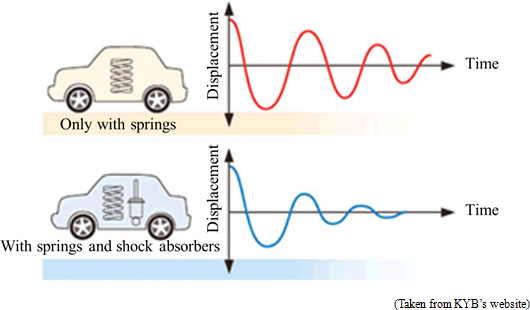 Furthermore, it deems the "steering by wire" system is another technology whose importance will grow in the future. KYB has earned a large market share of multifarious products, with the domestic share of OEM shock absorbers for automobiles being 43% and its global share being 15%, the global share of hydraulic cylinders for construction machinery being 27%, the domestic share of concrete mixer trucks being 83%, and the domestic share of earthquake dampers and the seismic isolation system being 38%. KYB has reviewed its policy on dividend distribution. Before the review, it set the annual DOE (Dividend on Equity ratio) at 2% or higher on a consolidation basis; however, while aiming for a consolidated payout ratio of 30% or higher, it decided that dividends shall be distributed basically at the conventional annual DOE of 2% or higher from the interim dividend allocation in this term. This means that dividends will be paid stably at DOE of 2% when the business performance is sluggish, whereas shareholder return will be made depending on profit when the business performance is healthy. KYB' target ROE for the term ending Mar. 2020 is 10%. Given that, for the term ending Mar. 2018, the total asset turnover and leverage are unchanged and the forecasted net income margin is 2.61%, ROE for this term will be 5.9%, which means there is still ample room for improvement. We should keep an eye on KYB's efforts at increasing profitability, such as profit improvement at overseas bases and acceleration of innovative manufacturing. Sales were on a plateau, and profit grew thanks to cost reduction. Sales were 355.3 billion yen, nearly unchanged from the previous term. The sales of the AC business dropped due to the yen appreciation, etc., while the sales of the HC business for construction machinery grew thanks to the recovery of the Chinese market. The ratio of overseas sales declined 1.4% year on year to 53.5%. Through the reform of its business structure, especially the cost reduction in the entire corporate group, cost rate and SG&A ratio improved 0.1% and 0.2%, respectively, segment income rose 5.9% year on year to 18.6 billion yen, and operating income increased 344.8% year on year to 19.2 billion yen. Both sales and profit exceeded their respective initial estimates and revised estimates, but below the goals of the mid-term management plan. Sales dropped due to the impact of the strong yen regardless of the overall healthy market conditions in and outside Japan. Sales rose thanks to the growing number of shock absorbers sold in China, Vietnam, and India. While the number of hydraulic pumps sold declined, sales exceeded those of the previous term because the respective number of electric power steering and CVT (Continuously Variable Transmission) vane pumps sold was healthy. Sales of other products, including ones for ATV (All Terrain Vehicles), dropped. Demand increased in Japan in response to the exhaust gas regulations, and overseas sales showed a double-digit increase thanks to the recovery in the Chinese market. Sales of special purpose vehicles declined due to the sluggish demand for reconstruction. Current assets grew 14.6 billion yen from the end of the previous term due to the increase in cash, etc. and trade receivables. Noncurrent assets rose 7.6 billion yen due to the growth of other financial assets, etc. and total assets increased 22.3 billion yen to 381.3 billion yen. Current liabilities augmented 4.8 billion yen due to the increase in trade payables, etc. Noncurrent liabilities increased 1 billion yen, due to the augmentation of debts, etc. Total liabilities were 211.5 billion yen, up 5.9 billion yen from the end of the previous term. Total assets grew 16.3 billion yen due to the increase in retained earnings. Consequently, the ratio of the equity that belongs to the owners of the parent company increased 1.8 points from 41.3% at the end of the previous term to 43.1%. The surplus of operating CF grew due to the increase in pretax income, etc. Investing CF did not change considerably, and free CF became positive for the first time in 6 terms. The deficit of financing CF shrank due to the augmentation of short-term debts. The cash position improved. At the 95th shareholders' meeting held in June 2017, KYB introduced a system called "Smart Summons" that enables access to documents related to shareholders' meetings via smartphones, tablets, and computers with the aim of increasing convenience of shareholders. As the "Smart Summons" functions in collaboration with the website for online execution of voting rights, voting rights can be executed on the Internet through electronic devices such as smartphones. In addition, contents of Smart Summons are accessible freely by not only shareholders but also other people. Taking into consideration the "Corporate Governance Codes" published by Tokyo Stock Exchange, KYB propels various efforts such as information disclosure that can be easily understood by shareholders in a proper manner and environmental arrangement that enables shareholders to smoothly execute their voting rights, and continues endeavoring to enrich dialogue with shareholders. Sales and profit are estimated to decline. Sales are estimated to be 355 billion yen, nearly unchanged from the previous term. The assumed exchange rates for this fiscal year are 1 US dollar = 100 yen and 1 euro = 110 yen, while the actual rates in the previous year were 1 US dollar = 108.38 yen and 1 euro = 118.79 yen. Although sales in the HC business increased, the impact of foreign exchange in the AC business remains high. Operating income is projected to be 15.6 billion yen, down 18.9% year on year. The profit of the HC business is estimated to decline due to the combination of product lines. On Oct. 1, 2017, the company plans to conduct a 1-for-10 reverse share split. As for dividends, the company plans to pay an interim dividend of 6 yen/share and a term-end dividend of 65 yen/share (taking into account the reverse split). When the reverse split is not taken into account, the annual dividend will be 12.5 yen/share, up 0.5 yen/share year on year. Payment ratio is estimated to be 34.3%. Both sales and profit are forecasted to decrease due to a declining sales caused by the impact of the strong yen and a deteriorated profitability resulted from the rising price of steel material. It is anticipated that the Chinese market continues its recovery and the domestic market condition is favorable mainly in the first half; however, it is projected that sales will rise but profit will drop because of an expected deterioration of profitability attributed to changes in product compositions, the increasing price of steel material, and such. KYB plans to continue to make investment, aiming for innovative manufacturing and establishment of an optimum production system. Under the slogan of "A GLOBAL KYB - CHALLENGE & INNOVATION -," KYB is striving to "complete drastic structural reform" in FY2017 and will make efforts to realize "sustainable growth," "stabilization of the earning base," and "solving managerial issues" in FY2018 and 2019 with the aim of "achieving sales of 398 billion yen in fiscal 2019." The company will aim to achieve sales of 500 billion yen in the group companies as a whole and earn the rating "A" as soon as possible after fiscal 2020. KYB established the motorsports department on April 1, 2017 with the aim not only of making a presence of the KYB brand stronger through motorsports but also of expanding technical capacities and developing human resources in the extreme world of motorsports. 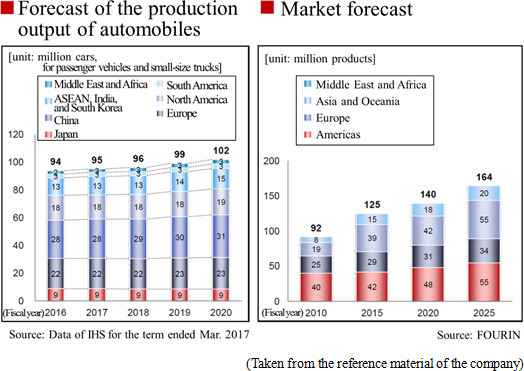 In the LMP class, which is the top category of the world endurance championships for automobiles, KYB's EPS was mounted on 26 vehicles out of the 31 participating vehicles in the previous term. The company, this term, aims to supply its EPS to all of the participating vehicles and provide technical support. At the same time, it will strive to realize the first installation of its shock absorbers in the class. Meanwhile, KYB supplied its suspensions to the Moto2 class in the previous term. The company will continuously accumulate results in this term and the subsequent terms in order to provide its suspensions to vehicles participating in the MotoGP class, which is the premier motorsports championship, in fiscal 2019. We asked President Nakajima to look back on the previous medium-term management plan, explain the main points of the new medium-term plan, and if he has any message for investors. Q: "In your opinion as president, what are KYB's strengths?" A: "The knowledge and know-how that we have cultivated while developing innovative monozukuri (manufacturing), and our high level of technological capabilities as a corporate group." Since KYB was founded, we have cultivated our knowledge and know-how while developing innovative monozukuri, as well as attaining a high level of technological capabilities as a corporate group. In order to refine this strength, the recruitment and training of skilled personnel are crucial. Although we have a long history, the number of engineering students who are familiar with our company is still low, unfortunately. We need to take initiatives to make our company known to students, for example, by improving the KYB brand. In terms of developing employees' skills, various training and education systems are important, but I believe that the enhancement of "site-oriented awareness" is the most important. In sales, when there's some kind of trouble at a production site and it causes inconvenience to customers, they should go to the site themselves and see what happened with their own eyes, and then prepare a report for customers instead of just receiving a report from the factory. By doing so, we will further gain the customer's trust. The "site" exists not only in sales and production but in all workplaces and occupations, and by having "site-oriented" awareness, I'd like all employees to gain the ability to truly determine the nature of things, not just superficially. Also, by sending employees abroad from a young age to have them absorb various cultures and ways of thinking and gain a broad range of skills as businessmen, we would be able to achieve personnel development for brushing up our strengths further. Q: "Could you please review the previous medium-term management plan?" A: "In the AC (Automotive Components) business, there were some problems remaining in the management of overseas factories. In the HC (Hydraulic Components) business, although the objective was unattained due to deteriorating demand, the implementation of a structural reform increased profitability." Unfortunately, both sales and profit goals ended unattained. Regarding the AC business, by expanding into countries such as Mexico and India, we further expanded sales, but due to the launch of a large number of factories in a short period of time, management could not keep up, and problems occurred in the number of personnel, retention rate, productivity, product quality, and various other areas. From now on, in order to reduce the impact of exchange rates as much as possible, we want to raise the profitability of each of our bases and prepare an "Earn More" system while further advancing efforts such as local production and consumption. Regarding the HC business, based on the demand for construction machinery in 2010, we invested carefully so as not to inconvenience customers, but due to the stall of the Chinese market thereafter, the demand sharply declined and the gap between estimates and results became exceedingly large. However, due to the effect of structural reforms implemented in fiscal 2015 and the bottoming-out of demand for construction machinery in China, we were able to greatly restore profitability in the final year, fiscal 2016. Currently, we are proceeding with restructuring, aiming for a profit-earning structure that can generate profits no matter how much the amount of work is reduced. Q: "What point are you particularly focused on in the new mid-term plan?" A: "Strengthening the product capabilities of shock absorbers for original equipment manufacturers (OEM), which is a core business. The development and introduction of innovation lines are crucial." The point is to strengthen the product capabilities of OEM shock absorbers, which is our core business. In addition to conventional products, we would like to provide high performance, high quality products such as lightweight products. Our test course reproduces the road surface conditions of Europe, North America, Japan, and Asia respectively, according to each environment. There, we use various types of vehicles to make comparisons, and adjust the product development system to meet customers' needs. Further improving the "high performance, high quality" brand image is extremely important because it also leads to the expansion of highly profitable commercial business. It is also necessary to develop and introduce innovative production lines to increase competitiveness. In the current shock absorber production line, there are still many areas that depend on manual labor, such as inspection. We realize that the development and installation of automated lines and other innovative production lines are an urgent matter in order to cope with the increasing manpower shortage and improve the management in overseas factories. At the moment I really feel like we aren't profiting as much as we could be. We invested quite a lot of money during the previous mid-term plan period, but there are still many locations where improvements could be made in terms of profitability. We must reorganize and improve our manufacturing approach to achieve the basic profit-earning structure "6:3:1 structure" (variable cost: 6, fixed cost: 3, profit: 1). I want to recognize the issues and gaps at each base, promptly crush them one by one, and build a system generating profits that match the investments as quickly as possible. Q: "Finally, could you kindly give a message to shareholders and investors?" A: "We're aiming to be the top brand in the world, so I would ask you to keep an eye on our company, and support us from a medium to long-term perspective." Since its founding in 1935, through hydraulic vibration control technology, our company has acquired a global position to some degree, however we are not satisfied with this and we believe that further increasing our presence and brand power will also lead to an increase in corporate value. We believe it would bring us and all stakeholders great pleasure to see customers all over the world acknowledge the excellence of our products. We're aiming to be the top brand in the world, so I would ask you to keep an eye on our company in the future, and support us from a medium to long-term perspective. Its share price recovered and hit a high in March, but has been sluggish since then, and that high is still lower than the high in 2011 or 2013. Profit grew considerably in the previous term, but sales and profit are estimated to decline this term. Sales and profit have been on a plateau for several years, probably because the profit expansion trend is unclear. In order to make the share price get out of this stagnation and get on an upward trend, it is indispensable to complete the 2017 mid-term management plan without fail. The key is the recovery speed of the HC business with the base of the stable profit from the AC business. 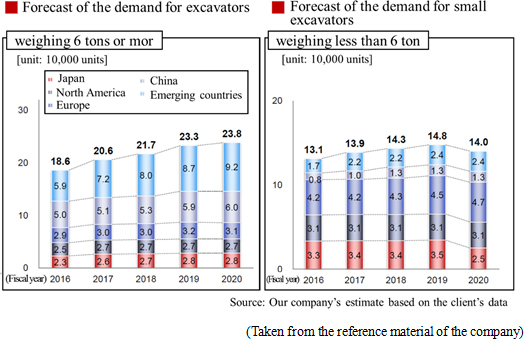 The markets of railroads and others are promising, but considering the time span of the fiscal year 2019, we should pay attention to the trend of construction machinery, which is dominant. We would like to pay attention to how the company will cope with the uncertainty in dependence on the huge Chinese market and boost profit.